Could there be a better sight in hot rodding? 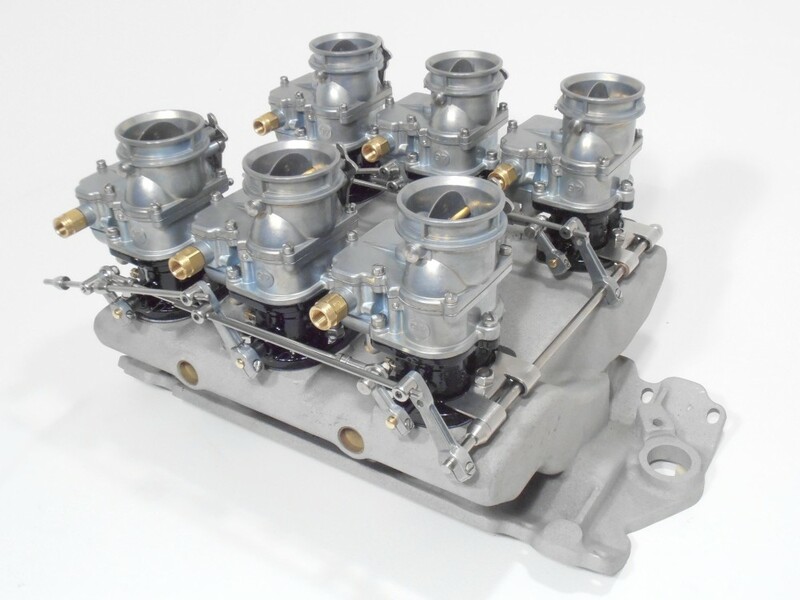 Six Stromberg 97s, loud and proud on the legendary Edelbrock Chevy X1 ram 6×2 intake? Alright, we’re biased…but you can’t deny it’s an eyeful. 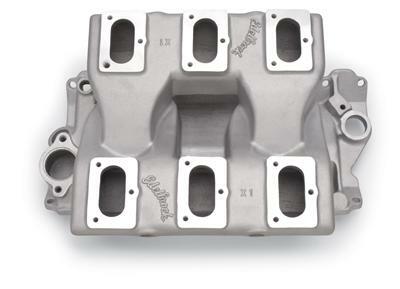 And that it’s right up there as the coolest news in nostalgia induction for many a year…Yes, Edelbrock are repopping that legendary X1 intake. We know, you’ve wanted one for years, but they were hard to find, right? 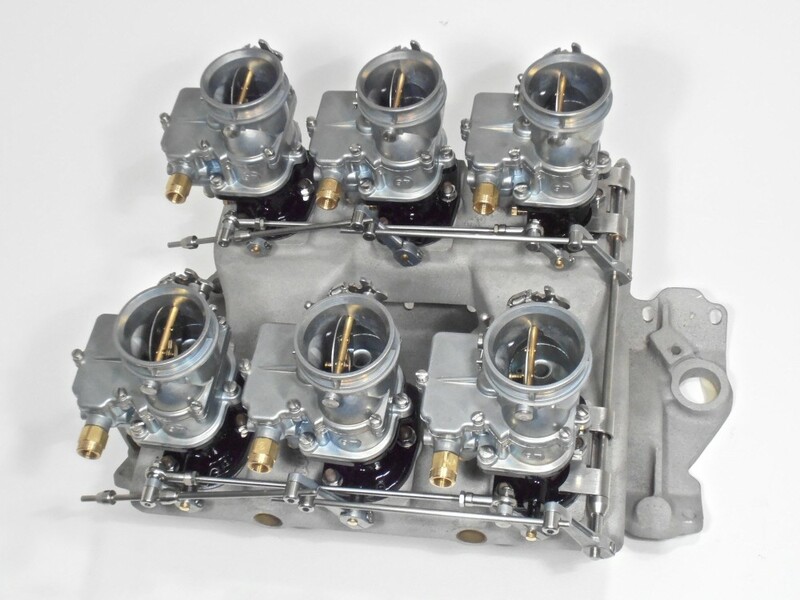 And yes they were expensive and beat up and dirty and all that stuff – like the original in our carb pictures. But not any more! Here’s the history bit. 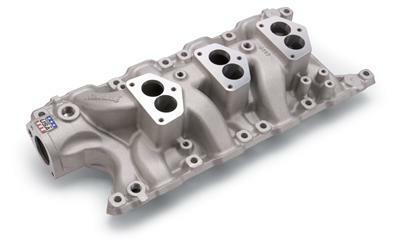 Vic Edelbrock Snr introduced the X1 ram six-carburetor manifold in 1958, getting 284 hp out of the hot new 283 ci Chevy engine. Alright, so it doesn’t sound too hot now, but this was 1958, remember. One horse per inch out of any motor was BIG NEWS! 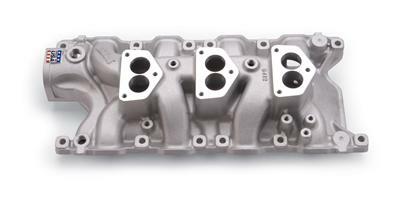 Cross ram was always going to be the way to go for high performance – still is – but one of its secrets was the long tapered runners, which allowed the mixture to accelerate at a steady rate towards the intake port. Best of all, it used six Stromberg 97s. Vic even guaranteed it would out-perform any other six-carb intake around at the time. According to the excellent book, “Merchants of Speed: The Men who built America’s Performance Industry”, the X1 was used to test Vic Jnr’s 339 inch Chevy powered ski-boat motor in 1961. WIth six 97s, it made 364 horse on the famous Edelbrock dyno. The following year it pulled 375 horse from a 283ci (!) motor when testing a new Polydyne profile camshaft over at Iskenderian Racing Cams. But wait, did someone say 6×2 linkage? Our super-cool new 6×2 and 4×2 TwoStep linkage range is ready to go! Launching at a dealer near you very soon. 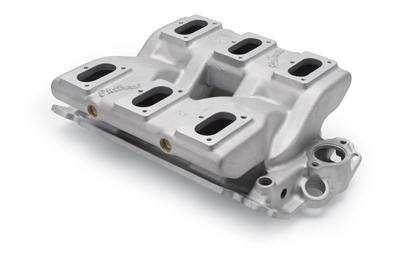 A modular range of direct and progressive linkage kits with a new low-line back-bar design that keeps the carbs as the star of the show, not the linkage. Here are some preview pictures. Email us if you need one right now. 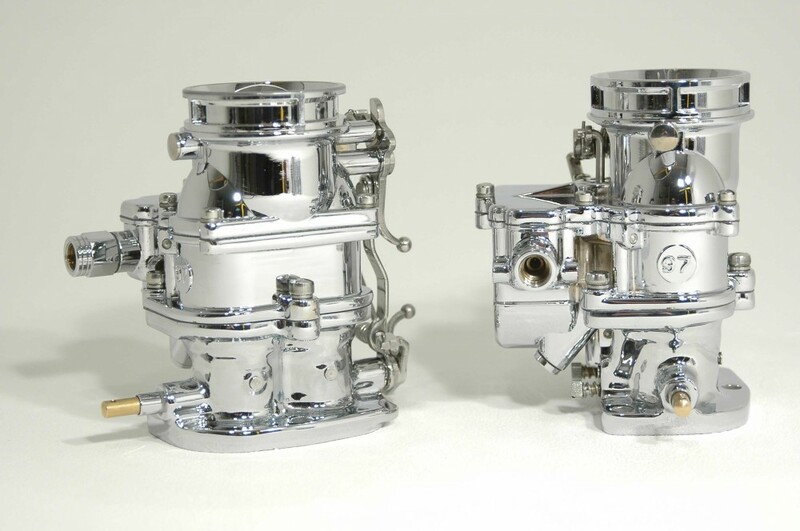 Plain and CHROME both available…..
Got some great news today. 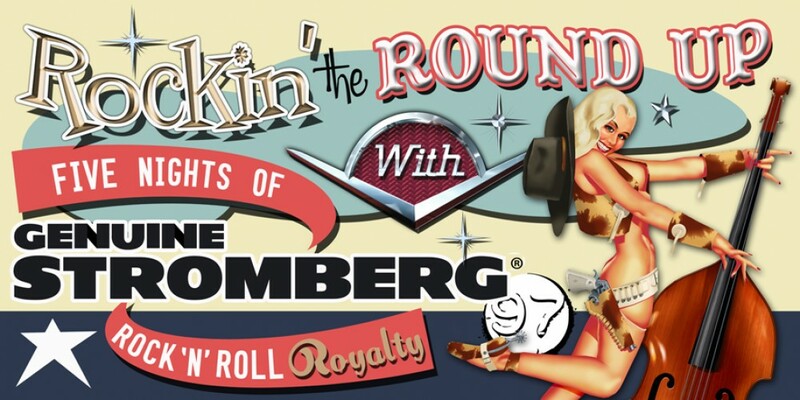 Stromberg is super proud to present five nights of Rock ‘n Roll Royalty at the legendary Continental Club (Austin, Texas) during the equally legendary 11th Annual Lone Star Round Up 2012. And it doesn’t get much more regal than the Queen of Rock, Wanda Jackson and His Royal Guitar Highness, James Burton! If you haven’t already registered for the event, click here for all the info you need. And if you’re not bringing your ride, the great news is, $10 general admission wristbands are on sale to the public, good for admission all weekend – kids under 12 are FREE. The event kicks off on Friday 13th April, but a lot of folks get there early, so our five nights at the Continental Club (1315 Sth Congress Ave, Austin), starts on Wednesday. Here’s the incredible line-up: Click the artists to find out more. Don’t forget, by the way, that there’s also great music throughout the day at the Round Up itself, (Travis County Expo Center, 7311 Decker Lane), plus full evening programs at Jo’s Coffee – FREE stage – and Trophy’s Bar, both on South Congress Ave .
Stay tuned for more event news and reports up to and during the event! Now we’re talking…Check these babies out. Full freakin’ insane chrome 97s, including the base castings? Yes way…Destined for George Papadopoulos’ new V-twin chopper, they’re the result of some incredible chroming and polishing work. We can’t wait to see the finished bike. 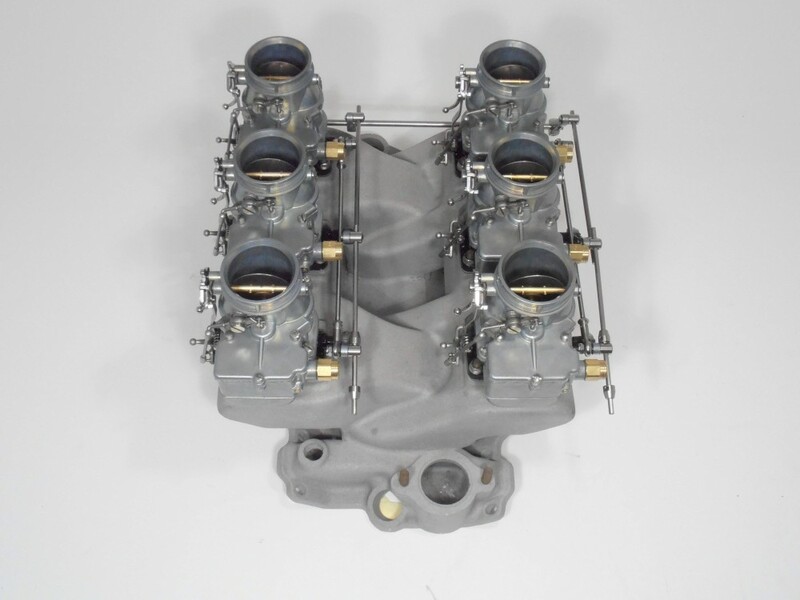 When we launched our 9510A-CHR chrome Stromberg 97 carburetor, we never really considered chroming the bases. For one, we liked the black lacquer contrast. And for two, they’re an absolute SOB to chrome so there’s a danger of losing the shape completely and the cost makes it unrealistic for most mere mortals. Bike builders are made of sterner stuff, though. And both these for George and others for Kon Zakzanis (for his two Billy Lane hubless bikes) have been fixed up through ace fabricator Steve Schuller (Helmetfreak@aol.com) who not only makes the clever intake manifolds, but has worked out the tricks you need to get them working great on a V-twin. These bases were chromed by Heavy Metal Services out of Barrie, Ontario, Canada (call 705-220-3124). 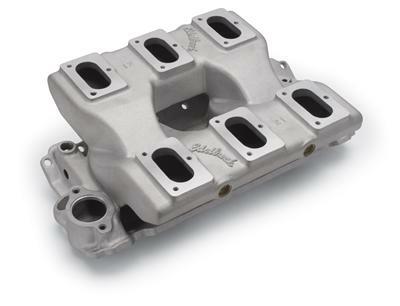 We shipped them out separately for chroming then they were fedexed back to us to build the whole carb. All I can say is….respect is due to Darryl, they’re damn flawless. And you can’t say that about chrome very often. We’ll spare you the Stromberg chrome 97 advert. Just click the link for more info.